Fans of The Fusion in Frankfort are looking forward to the restaurant owners’ newest venture in downtown Traverse City. Fusion Love will serve Asian street fare with an emphasis on fast, flavorful takeout. As of October 3, 2016, plans for Fusion Love have been halted due to building issues. Fusion’s owners are hoping to find another location downtown. With the help of Traverse City designer Shane Inman, VaChong and Bobbiesee first started looking for a new restaurant space about eight years ago. They wanted to be on Front Street but couldn’t find the right building. Years later, they found the space they were looking for. The new Traverse City restaurant will be located at 317 E. Front Street next to the Michigan Artists Gallery. But transforming the former office space into a modern restaurant is no small task. The design process is being led by Shane with help from local builders. Shane is the president and senior principal designer of his business, The Inman Company. The residential and commercial interior design firm started off small in Traverse City but is now based in Manhattan with offices in Traverse City and Chicago. “Traverse City is my hometown,” Shane says. “It’s where I started my business, and the community believed in me. I want to do something magnificent for them.” Fusion Love will be the first restaurant in Shane’s portfolio. For the project, The Inman Company is partnering with its preferred industry partners including KA Construction, Kitchen Choreography, Image360 and Consolidated Electric, among others. 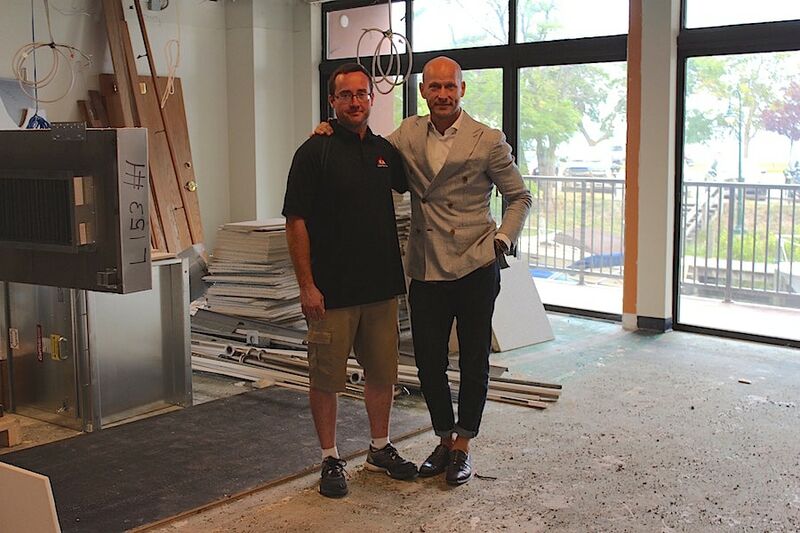 Founder of KA Construction Kris Arnold (left) and Shane Inman inside the future location of Fusion Love. Walking in, visitors will be presented with two options: takeout or sit-down dining. For those on the go, the takeout menu will be featured on the wall. After ordering, guests can wait at the window-side bar overlooking Front Street or sample free teas at the tea station. A window next to the counter will offer views of the kitchen. Once a guest’s order number is called, they can check their bag, and if something is missing, make a request straight to the kitchen. In the dining area, a wall of windows offers views of the Boardman River and West Grand Traverse Bay. A community table will be available for large groups or for individuals to come and meet other diners. Touches of gold will accent the black decor. One of Shane’s favorite features of the design plan is the electrical outlets and USB ports that will be available at every dining table and in the takeout area. “It’s going to be a very tech-friendly restaurant,” he says. In addition, free device charges will be available for guests to use and take home with them. When construction begins, a time-lapse video of the entire project will be available on the Fusion Love and The Inman Company websites.